Released in October of 1941, The Maltese Falcon (John Huston, 1941) is considered to be an important piece of classic cinema, a cornerstone of film noir and the birthplace of the hardboiled detective on-screen. Huston’s Falcon was not the first adaptation of the Dashiell Hammett story. 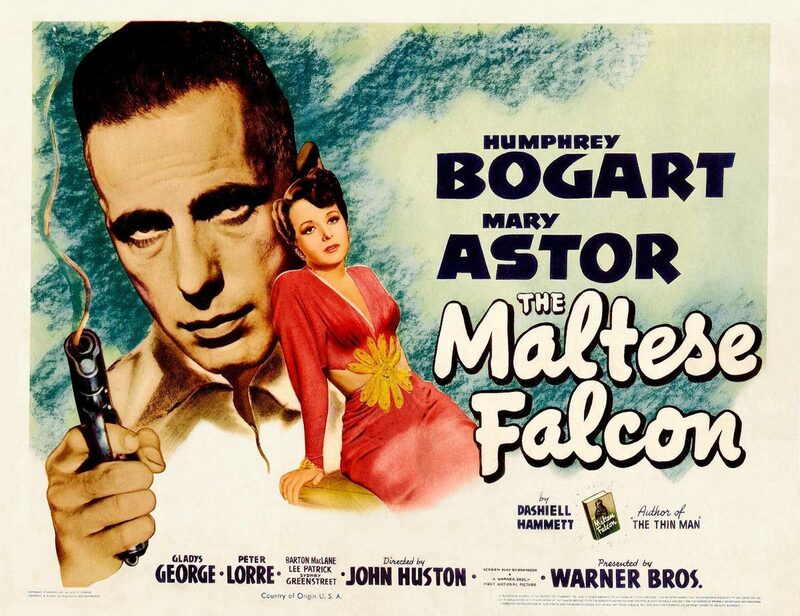 The first version, also titled The Maltese Falcon, was released in 1931 and directed by Roy Del Ruth. It’s worth checking out for its ragingly naughty pre-code-ness and because leading lady Bebe Daniels and star Ricardo Cortez are both total babes! The second version, Satan Met a Lady (William Dieterle, 1936), features the awesome Bette Davis and Warren William! Davis may not have been fond of the film, but it’s certainly worth a look. Watching The Maltese Falcon and learning about what went into its production, it’s practically impossible to believe that this was John Huston’s directorial debut. The film is so tight and flawless, so even and well-handled that it doesn’t seem realistic that a budding filmmaker created it. This film jump-started many people’s careers, most notably Humphrey Bogart. He had done two bigger parts in films leading up to this in They Drive By Night (Raoul Walsh, 1940) and High Sierra (Raoul Walsh, 1941) and a variety of bit parts but Bogie was not an actor of any distinction until the success of The Maltese Falcon. Originally, George Raft was to play Detective Sam Spade. But Raft didn’t trust a newbie director, let alone a director/screenwriter! After being sent the Huston-penned script, it didn’t take him long to reject the part. The story had already been filmed twice (failing both times) and this time it had some neophyte at the helm? No way! 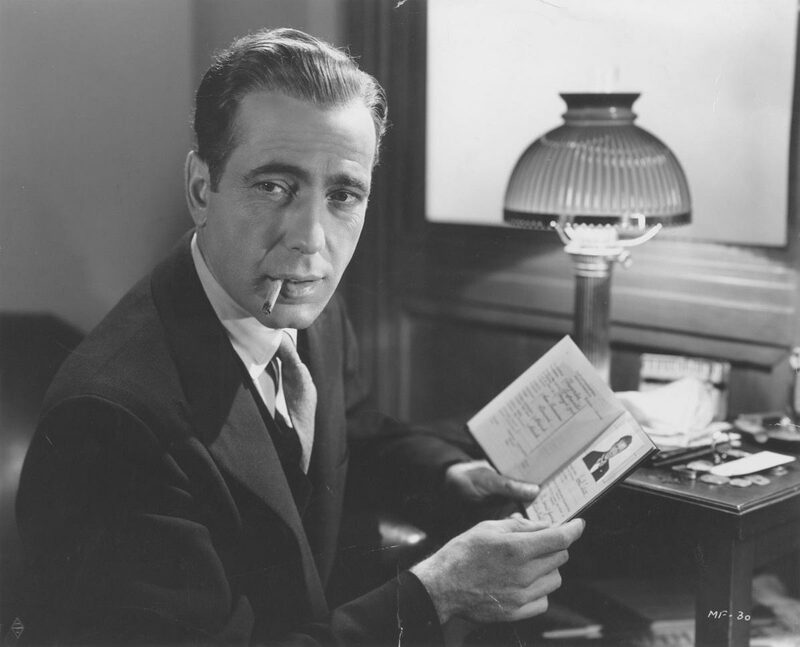 In a letter to Jack L. Warner dated June 6, 1941, Raft wrote, “I strongly feel that The Maltese Falcon which you want me to do is not an important picture.” With that, Humphrey Bogart was immediately cast as Sam Spade. 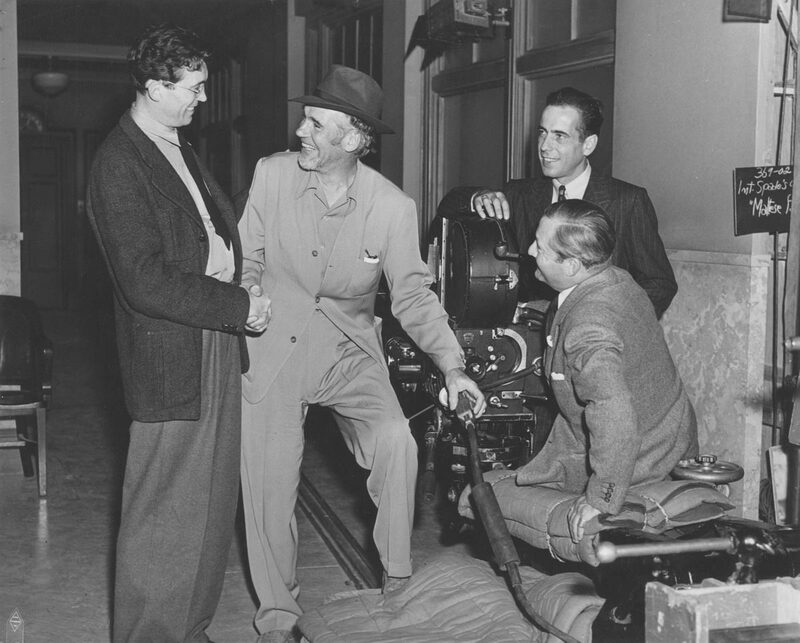 The Maltese Falcon property already belonged to Warner Brothers by the time Huston wanted to shoot. When Hollywood began expressing interest in Hammett’s work, it was just a five-part serialized story published in H.L. Mencken’s Black Mask pulp magazine. Hammett took the hardboiled detective story, adapted it from the grimy pages of the pulp into the more socially acceptable format of a bound novel. Warner Brothers then bought the property from the publisher, Alfred A. Knopf, in 1930 for $8500. 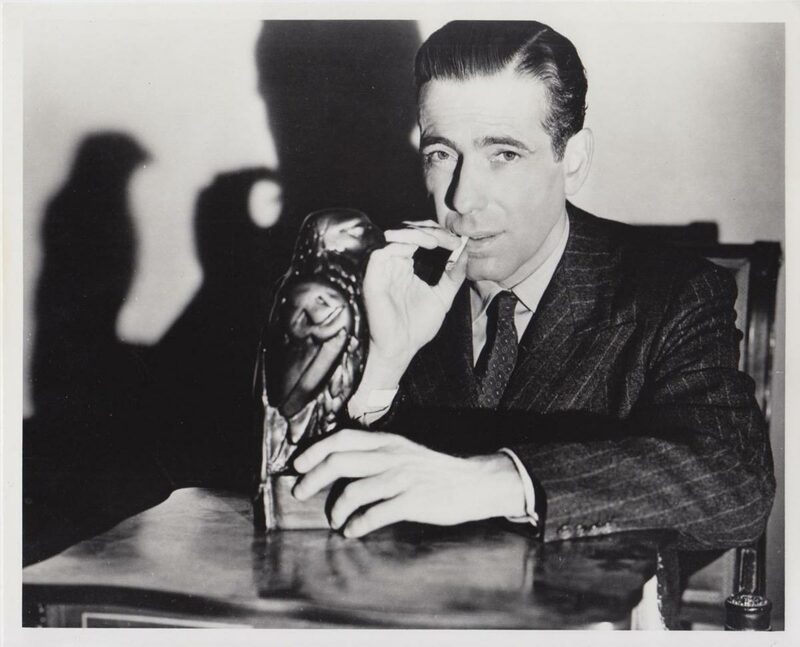 Sadly, when the writer attempted to go back and work with the character of Sam Spade, he was informed that he no longer owned the rights to Spade; they had been sold to the studio along with the script for The Maltese Falcon. This fact haunted Hammett for the rest of his life. Dashiell Hammett was a fascinating figure in the world of literature, film and politics. If you’ve seen many westerns (or even the TV show Boardwalk Empire), you may have heard reference to the “Pinkertons” or the “Pinkerton Agency.” Dashiell Hammett worked as a Pinkerton Detective from 1915 to 1922, serving in WWI somewhere during that time. This experience led to two things: his affinity for private detectives in his literature and his political activism. Having witnessed and played part in the breaking up of Union strikes, he became uncomfortable with his position at the Pinkerton National Detective Agency. Eventually Hammett would become left-wing enough to go “Full Antifa.” He became a card-carrying Communist, and continued to be an activist throughout his successful writing career, even going to jail during the Blacklist for refusing to name names. Dashiell Hammett’s prose inspired many authors- Raymond Chandler, James M. Cain, Donald Westlake, and even William S. Burroughs, just to name a few. Still recognized as the genesis of what we now consider hardboiled detective fiction and the private eye, Hammett’s contribution to literary and media culture is extensive. From The Thin Man to the Coen Brothers’ Miller’s Crossing, Hammett has made a mark. The Blacklist had a very serious effect on him (as it did on many others) and he was never the same after prison. Always a sickly man, his alcoholism and smoking did him no favors. His partner – screenwriter, playwright and activist Lillian Hellman – was with him until he passed away in 1961 at the age of 66. John Huston’s The Maltese Falcon reveals a brutally different Humphrey Bogart. The Humphrey Bogart in this film is shockingly unsympathetic. The character of Detective Sam Spade is meaner, darker, and less morally limber than any other film noir character Bogart ever played. He is magnificent. The camera is regularly placed in a lower position when shooting Kasper Gutman (Sydney Greenstreet) in order to make his 285-pound frame seem larger and more intimidating. But his villainous-ness seems somehow normal. He’s a bad guy, but he’s not going to do anything extraordinarily crazy. He’s Reliable Evil. The delineation in Falcon between villain and what ends up being the chilling Morality of The Private Detective shows itself in the finale. Spade/Humphrey Bogart is sitting in that room alone with Brigid/Mary Astor, looking straight ahead, dead-eyed, telling her about his personal principles. This might be the most terrifying scene in the entire film. The expression on his face resembles that of a condemned man. Even in Bogie’s darker films where he plays the bad guy he never gets THAT look on his face. It took them three days to shoot these final scenes that consisted of 8 pages of dialogue. There was supposed to be a different ending but they nixed it because of the haunting tone that Huston got from his actors during this three-day-shoot. Today endings like the one in The Maltese Falcon are taken for granted. In 1941, critics and audiences were shocked at the film’s dark finale. It accomplished the goal of making the work one-of-a-kind.